At 8VC we invest in technologies with the capacity to transform antiquated processes in old-line industries. In the private sector, one of the least tech-enabled industries is Law. We are excited by the opportunity for smart software tools to enhance lawyers in a new form of man-machine symbiosis. Legal technology of the future will allow lawyers and clients to visualize the “legal ontology” of deals such as company formation, investments, acquisitions, vendor relationships, corporate governance issues, transparency agreements and more. Software will hone in on contested terms, harness statistical analysis to flag unusual clauses, and provide historical context on standard ranges — allowing all parties to quickly understand, negotiate, and execute transactions. AI companies have made great strides in automating basic repeatable tasks in the legal industry. Companies such as LegalZoom have “commoditized” basic legal documents such as deeds, leases, regulatory filings, trusts, patents, and insurance claims lawsuits. Automation of low level processes saves paralegals the headache of generating standard paperwork from scratch and is useful for small business owners who formerly had to consult lawyers for basic contracts at steep fees. Technology companies will never succeed in replacing lawyers wholesale. The practice of law requires creative interpretation of precedent and deeply human intuitions about fairness, reasonability, and compromise. However legal technologies can succeed in streamlining legal workflows, empowering law firms and partners to better serve their clients and maintain their margins as technologists automate parts of the discipline. Frustrated investors are badgering their CFOs to figure out why the round is taking too long. CFOs are trying to make sense of jumbled emails and skimming legal documents to try to uncover irregular terms so that they can flag them for the investor; the investor may then interrogate the CEO of the startup about why a particular term has cropped up. The CEO of the startup has to get on a series of calls with his lawyer who was trying to protect the startup’s interest by inserting favorable spikes into the contract, and with the investor’s lawyers who are demanding standardized terms. In these kinds of situations — which, as any investor or entrepreneur will tell you, are quite common — all four parties iron out their differences over a course of many weeks. The clumsy, haphazard process of deal construction lends itself to misunderstanding, tension, and awkwardness, and ultimately risks the delicate relationship balance on which the deal is predicated. To simplify to the legal workflow of a transaction we need software that seamlessly enables investors, entrepreneurs, and their respective law firms to upload core documents to a shared location, track edits between the firms on versioned documents, understand how quickly progress is being made, and determine whether there are unique issues to review. Deals should be resolved according to fair guidelines that mirror industry standards rather than through a tortured, opaque process that risks damaging relationships. Software that reveals the essential structure of a deal will give lawyers an edge in maintaining transparency with their clients, rapidly sifting information, and clarifying differences with lawyers at other firms. In the future, machine learning algorithms will continually parse text in documents, match textual provisions to legal concepts, and pull real-time statistics on whether a given term is standard or unorthodox. Legal ontology software will create an intuitive visualization of the financial and temporal skeleton of a deal, extracting insights from documents such as voting agreements, stock purchase agreements, rights of first refusal and co-sale agreements, legal opinions, management and investor rights documents, indemnification agreements, certificates of incorporation and compliance, and schedules of exceptions. Stripping these files down to their most salient provisions will allow parties to refer to a shared schema in negotiations. 8VC has begun investing and building along the axis of our thesis. We are proud co-founders of a company called Anduin, which is building a legal ontology toolkit that will transform the discipline of Law. In the near future, we will be able to automate reporting, flag key items, and assign responsibility as it passes from one party to another over the sequence of a deal and parties finalize documents. Anduin’s product elegantly integrates red-lined Microsoft Word documents, cap tables, and signature blocks. 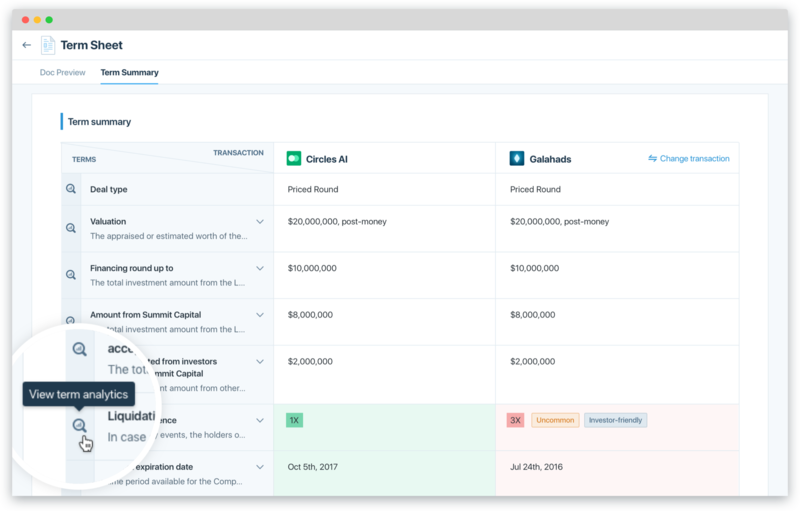 Progress dashboards will make it easy for investors and CEOs to determine where they are in negotiations and allow partners at law firms to quickly and transparently assign tasks to their employees. Lawyers will be able to spend their time on the challenging knowledge work at the heart of their vocation rather than managing frayed tempers and repeatedly explaining concepts on calls. Ultimately, Anduin’s legal ontology will offer automated judgments on issues of convention, jurisdiction, and precedent that help to guide the process of a deal, sustain trust between parties, and achieve fair outcomes.